Financial District, NEW YORK—Brian Stewart, a freshman at The King’s College, self-published The World We’re From Sept. 10 through Amazon.com. 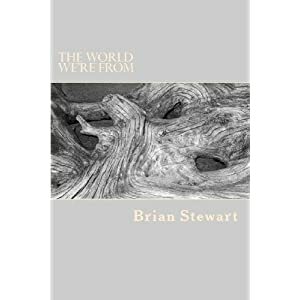 The World We’re From is a compilation of poetry Stewart has written within the last two years about himself and life to which readers can relate. Stewart explained that there are points in the book where he’s dreaming, down on himself and even conceited and narcissistic. Stewart explained that his goal is not to force thoughts on people. He wants to share his story but get the attention off of himself by drawing readers in through shared experiences, catalyzed by his diction, tone and style. “For me it’s interesting the way I can tell my story through poetry. Because we’re young, a lot of people don’t really know how we feel,” Stewart said. “A lot of people don’t know what’s really in our minds and how we view the world. Through my book you’ll be able to get a better understanding." Stewart’s parents told him that he should put the poetry into a book to save it, but he only toyed with the idea until after he graduated from high school. Stewart came to a standstill for a number of months, but his friends would ask him periodically how the book was coming. Stewart’s book was self-published and edited through a company called CreateSpace.com by Amazon.com. In order to receive feedback, he brought the manuscript to different writing workshops throughout New York City, including The Writers Guild of America East. The Guild taught him how to market his book. Once edited, it was only a matter of hours before the manuscript was typed and published. “Basically you’re like your own boss,” Stewart said. Self-publishing is free unless you purchase expanded distribution like Stewart did. This means that within approximately six weeks the book will be in stores and online stores—expanded beyond Amazon.com. Stewart encourages people to read his book and to be honest. He likes criticism and believes it’s good to start conversations and debates. Purchase The World We’re From on Amazon or get the free Kindle version.